We all know there are problems with the meat industry. For those of us willing to learn, and to invest some time and money, there are viable alternatives. Here’s how we took back a part of our own food production. My boyfriend and I had been giving a lot of thought to where our food came from, and found that industrial meat was the most problematic aspect for us. To test out an alternative source of meat, I brought home two turkeys. The two toms looked like they came straight out of Jurassic park, were sociable, funny and slightly scary. While we were still busy watching home butchery videos and plotting the turkeys’ demise, the summer passed, they had grown very large and started fighting each other. When I announced that they were going in the freezer the next week, my gentle aunt couldn’t quite believe it. ‘You’re going to kill them? But they’re such sweet animals!’ I suspect that steak she had for dinner the day before also came from a perfectly sweet animal. The two young toms provided 20 meals for two to three people, a day of organ meat for the dog and litres of tasty stock that enriched our meals for months to come. As we don’t eat much meat, they provided enough to last us months. Slaughtering and butchering them was hard, dirty work, but we had family and friends to help us, and in the end we felt like we had earned our piece of meat, and appreciated every bite. Butchering them was hard, but we had family and friends to help us, and in the end we felt like we had earned our piece of meat. I like the idea that one animal can provide a lot of meat, so you don’t have to kill too many, but the industrial meat turkeys we got proved to be a bit large for us to handle at home. I learned later that this breed of birds is not capable of growing older than butchering age in good health, as they have been bred to grow so much muscle that their legs cannot support them. This is just one of many things that is wrong with the industry, and that we didn’t want to continue supporting, not even by buying young birds and raising them ourselves. The medicated industrial feed from the farm shop wasn’t quite good enough either. Thus we went on a search for a smaller, more resilient animal that was not industrially bred and hatched, and found biological grains from a local farm to feed them with. 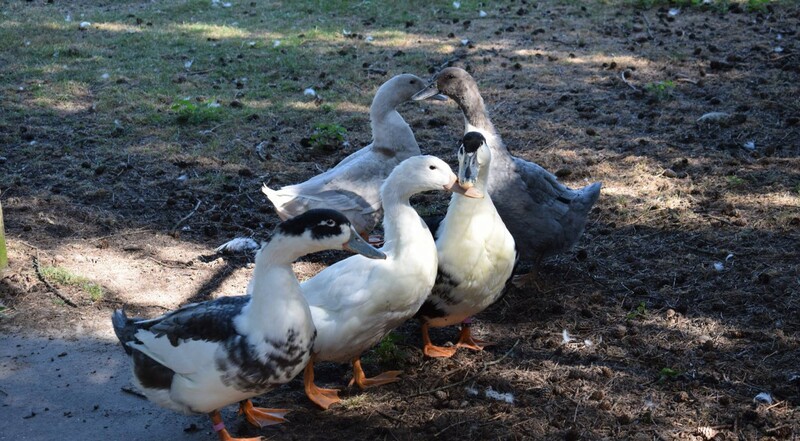 Ducks of Dendermonde have been around in Belgium for a few centuries as dual purpose production animals. They lay wonderful eggs, and provide tasty meat (and a lot of entertainment). Due to the rise of industrial breeds, their numbers have dwindled in the last century, to the point where there is barely enough genetic diversity left for the breed to function without adding new blood. Luckily, a few dedicated breeders are doing all they can to save them. That’s how a group of ducks of Dendermonde ended up in our meadow. We chose ducks because it is our favourite type of meat, but the choice to pick a heritage breed was made for reasons that are more important. Animal breeds bred for the meat industry have been selected and manipulated to grow fast, not old, and to put on a lot of meat, often only in specific body parts. Small farms in the past would have had no use for animals that were only good for one thing. I think we need to take a step back from the industrial kind of specialisation if we want to produce our own food on a small scale. As the industry animals spend most of their time indoors, all of the other things breeders would usually look for in a breeding pair didn’t matter anymore. Health is not important, as health problems are considered normal and solved with preventive antibiotics, and by the animals getting killed early enough so they’re not a problem for long. Fertility problems are solved with artificial insemination and brooding machines. I don’t want to be that kind of breeder. I want healthy, resilient, pasture-raised animals that have a few bad seconds at the end of their lives, rather than a painful life. My mother ducks should grow old and raise a lot of ducklings, if possible without much help from me. Some of those ducklings should go on to live with other new enthusiasts to make sure the breed lives on, and some should feed my family. I think it is worth preserving this DNA that is still engineered by the old methods, by carefully selecting the best animals to breed with and letting nature take its course. It is worth saving a breed of animals that can live a long, productive and healthy life outdoors. They shouldn’t have to face problems that come from being genetically engineered to enlarge a single trait like breast meat. Keeping these heritage breeds at home, or supporting small, biological farms that raise them can provide a valuable alternative to the conventional meat industry. I believe that the best way to preserve these heritage breeds is to let them take their place as production animals again, rather than keeping them in the show circuit. Animal welfare should be the highest priority and they should be farmed on a smaller scale, where one can keep an eye on the health of each individual animal. Whether you raise chickens, pigs, cattle, ducks or anything else, every animal you buy from a small breeder that sets high animal welfare standards and raises heritage breeds is money that does not go straight back into a system you don’t want to support. If you can also feed those animals organic grains that were grown on a field near your home, grow herbs for them in your garden and let them forage for bugs and grass, you do as little harm as you possibly can, without becoming a vegetarian. There is no way around it: in order for you to eat an animal, someone has to break its body in such a way that it doesn’t work anymore, then take it apart so you can cook and eat it. If you don’t want to do this yourself but you do buy the end product, you give someone you don’t know permission to do this in any way they see fit. You are responsible for what happens to that animal, and you give your hard-earned money to the people who raise, kill and butcher it so that they can continue doing it this way. This means you need to make sure those people produce meat in a way that you think is acceptable, or you can do it yourself. Despite the fact that some of them have an earlier-than-natural ending, I think my animals live a much better life than many others, pets included. I have not yet found a good justification for killing animals for meat, and I don’t know if there is one, but I have not found the killing of an animal for meat to feel unnatural, though it has made me sad at times. Dispatching an animal is not an easy thing, and it’s not meant to be. By doing it yourself, you take full responsibility for what happens, and you can make sure it is done right. Another advantage to butchering your animals at home is that the animal does not have to suffer transport, and its stress can be reduced dramatically, which is good for the animal as well as for the quality of the meat. Dispatching an animal is not an easy thing, and it’s not meant to be. If you want to keep eating meat without raising and butchering your own animals, it is well worth doing some research. Try to find meat that you can eat without having to suppress the knowledge of where it came from. It may be more expensive and less convenient, but if you eat less of it you can invest in better quality. If you want companies to produce your meat cheaply, they are not going to use better, more humane and healthier methods. It is better to give the right people the money they need to do it in a way that is acceptable, or to take matters into your own hands. Producing your own meat is a very rewarding journey, but if it’s not for you, you can always take the next step up the evolutionary ladder of ethical humanity and become a vegetarian. Mushrooms and vegetables are also a lot of fun to grow in your back yard, and a lot less messy and expensive than meat. You can always keep a few heritage ducks or chickens to provide you with eggs and to keep your garden bug-free and fertilized. N.B. : A word of warning for people who want to raise, kill and butcher their own animals: do your homework. Local laws and regulations, which breeds would suit your purpose, how to keep them healthy and happy, how to slaughter them properly and how to make the most of the carcass are all things you need to know about. I have listed some books below that were very helpful to me. There are a lot of good blogs out there written by farmers and homesteaders. Youtube can be a good resource if you are critical about selecting the right videos and watch enough of them so you can compare. If you can, try to find someone who knows how it’s done, to guide you until you are confident. Good luck! All photos are the authors. Eating animals by Jonathan Saffran Foer – a combination of philosophical questions about our relationship with animals and information about the (American) meat industry. It has not quite made me a vegetarian, but has definitely strengthened my resolve to stay clear of the meat industry. Butchering poulty, rabbit, lamb, goat, and pork: the comprehensive photographic guide to humane slaughtering and butchering by Adam Danforth – not a good coffee table book, but a fantastic resource on everything from food safety to humanely slaughtering the aforementioned animals in their home environment, and how to produce the best cuts of meat. River Cottage Veg by Hugh Fearnley-Whittingstall – lots of great recipes for those days when you don’t want/need meat, or are in need of a good side dish. The River Cottage meat book by High Fearnley-Whittingstall – Good recipes, also for lesser known cuts and offal, but also a lot of information about the (UK) meat and game industry and where to get meat from acceptable sources in the UK. Duck eggs daily by Lisa Steele – a great resource for those raising ducks as pets and for egg production. Contains plenty of info on health and behaviour. Levend erfgoed by Steunpunt Levend Erfgoed – a lovely book with a lot of info and pictures of the Belgian heritage breeds. This one is in Dutch, but maybe you can find publications in your language, on your local heritage breeds. Websites of heritage breed clubs – they exist in a lot of different places and languages! Find a local one and see what heritage treasures your country hides.